single storey house, two bedrooms, GR34, TV sat, WIFI, sea, beach, pets allowed. Single storey house for four people, is rented from Saturday to Saturday, two rooms with a bed of 140 in each room, individual, new, bright, quiet, surrounded by greenery, no neighbors, no vis à vis, not lying not in a subdivision, the countryside and the sea, located on the wild peninsula, close to the sea, (800m), 5 minutes from the beach, overlooking the archipel of Bréhat a room and terrace, access to the garden of each room. the garden does not need to be closed, private way to access it, and the place is quiet. The very clear reception of German and English TV channels. From the cottage you see the island of Bréhat, near the small beach of pors-guyon located at the end of the bay of Pommelin, discover the small island of Castel yar, the sandy beach surrounding this little corner of paradise will be a privileged place of relaxation, you will benefit from a great panorama overlooking the estuary of the trieux and the archipelago of Bréhat, all around you have small sand jackets, swimming allowed on all the peninsula. Possibility of kayaking at sea. The GR34, you will discover beautiful landscapes along our coast of Brittany. Near the Sillon du Talbert, unique site in Europe that stretches 3km at sea without overlapping. at the foot of the furrow, a panoramic sea view restaurant, terrace feet in the water. The peninsula is very characteristic and has a myriad of islets and small islands, the island of Bréhat is a small paradise, known for its flowers and its sweetness of life, the island has an exceptional flora, its shredded coast and bristling with picturesque rocks offers many small well-sheltered havens, a dreamy side for lovers of the sea, many stars offer the tour of the island in about an hour, a change of scenery. A tourist trip in a small road train can take you to visit the coast of Paimpol. Rent electric bike near. Hiking, boat trip also. Fishing possible near the coast, fishing on the high tide. (Shrimp, clams, oysters, St-Jacques shells) .this house will allow you to discover the pink granite coast. park on a flowered site in Armoripark in Bégard, with an aquatic center and outdoor activities, visit the castle of La Roche-Jagu with its exhibitions and activities in Ploezal, free access to the park and gardens, 150 animals to discover including a couple of little pandas at the zoo Trégomeur, Near Perros, discover the navigation at the miniature port, take a trip back in time, discover the valley of the Trieux between Paimpol and Pontrieux aboard a steam train, boat trip in the city of Pontrieux to contemplate its fifty laundered restored, Tréguier, small town of character, to visit, the marine aquarium Trégastel, unique in the world, the labyrinth of rocks leads you to the heart of the aquarium under thousands of tons pink granite, You have the ocean discovery park, Océanopolis in Brest. Very close to your rental, 2 km away, the Sillon du Talbert, unique site in Europe, clean air at the end of the world, accessible for 3 km, with possibility to fish the bar. Benefiting from an ideal situation to leave to discover this beautiful region of the coasts of Armor. Zone Héraultique Lanmodez (oysters and mussels to buy on site) .A nearby seawater retention at the beach Tossen paimpol. park on a flowered site in Armoripark in Bégard, with an aquatic center and outdoor activities, visit the castle of Roche-Jagu in Ploezal, free access to the park and gardens, 150 animals to discover including a couple of little pandas at the zoo Trégomeur, Near Perros, discover the navigation at the miniature port, take a trip back in time, discover the valley of the Trieux between Paimpol and Pontrieux aboard a steam train, walk in the city of Pontrieux, small city Brittany, to visit, the aquarium marine Trégastel, unique in the world, the labyrinth of rocks leads you to the heart of the aquarium under thousands of tons of pink granite, You have the Ocean Discovery Park, Oceanopolis to Brest. Very close to your rental, 2 km, the Sillon du Talbert, unique site in Europe, clean air at the end of the world, accessible on 3 km, with possibility to fish the bar. Benefiting from an ideal situation to leave to discover this beautiful region of the coasts of Armor. Zone hostréicole Lanmodez (burrs and mussels to buy locally) .In town, Paimpol and Tréguier 15 km. Discover the Trieux, walk to sea, leaving Lézardrieux, it is nearby. Take the GR34, the famous customs footpath, marvel at the beauty of the coast of Armor coast. Internet at your disposal, free telephone. Flat screen TV with satellite reception of French and foreign channels. The coast offers a beautiful coastline, full of surprises. Sea area, the Trieux estuary and the Bréhat archipelago "the island of flowers and pink rocks" enjoying a mild climate, aboard a boat, crossings and tour of the island every day, with the ferryman of the trieux, maritime cruises of Lézardrieux, you have navigable water bodies of a beauty to cut you the breath. With its beautiful beaches and rocks, the pink granite coast of Perros-Guirec, Ploumanac'h and Trébeurden. The GR34 runs along the Breton coast over more than 400km in armor coast. Feast of sea songs. Opportunity to visit Mont Saint-Michel, access is free and accessible all year. Departure from Lézardrieux, The boat, the Ttieux Passenger, commented walks on the river Trieux and its estuary, a navigation site classified Natura 2000. Free animals. Rentals are from Saturday to Saturday. We live in a region with idyllic landscapes. Take advantage of high tides to go fishing on foot and bring back clams, oysters, shrimps, clams, cockles. Take the time to visit the beautiful Breton cities of côtes d'Armor, Perros-Guirec and its famous village of Ploumanac'h, Paimpol, Tréguier, inside, the small city of Pontrieux character with its wash-houses. Also enjoy Breton flavors, St Jacques shells, Paimpol coco, pancakes, cakes. Gr34 nearby.The boat the coureur du Trieux to make you discover the meanders of the Trieux on the estuary to the sea. You like hiking, sea trips, sports activities (canoeing, golf, mountain biking) c is the ideal place. Local summer festivals, folk, open to all free. Castles, abbeys and fields in summer all summer, an extraordinary garden in La Roche-jagu, overlooking the estuary of the Trieux accessible free. Markets: Tuesday night in Paimpol, Wednesday in Tréguier in summer. The peninsula is very characteristic and has a multitude of small islands. Singing sailors in Paimpol 2/3/4 August 2019, do not wait until the last moment. Pontrieux estuary bottom town on the banks of the Trieux, with its flowery wash houses, celebrating the summer. a room spatieuses bath, full near the two rooms. WC + washbasin + shower extra flat large dimention. Easy access, recommended for people with reduced mobility. Everything is on one level. (Stool available to sit). A fantastic place for a restful holiday. A wonderful place to stay, clean and well maintained. It was ideal for us and our elderly parents one of whom is disabled. We made full use of the lovely garden sunbathing, eating drinking and just relaxing. Mme Rouzes was very welcoming and provided delicious pancakes, a cherry pudding and a bottle of local cider on arrival. The scenery nearby is stunning and all the surrounding villages were beautiful. We enjoyed visits to Lannion, Paimpol and the long walk at Sillion de Talbert. Thank you Mme Rouzes for a wonderful week. thank you for your comments, my husband and I are very touched, was our pleasure to have you, thank you again, Mme et Mr Rouzes. Proprietaire très sympathique , belle maison . MERCI pour vos bonnes appréciations, au plaisir de vous revoir, Mme Rouzes. Si vous avez besoin de calme, de silence et de repos....ne cherchez plus! Couple de trentenaires, nous avons passé un très agréable séjour hors saison dans cette belle maison trés bien située pour découvrir la région. Possibilité de partir facilement en ballades à pieds et non loin en voiture de sites d'intérêt naturel, culturel et patrimonial dans la région. La maison est bien tenue, confortable, chaleureuse, propre et trés bien équipée. Nous remercions Madame Rouzes pour son accueil, sa discrétion, sa disponibilité et sa délicieuse et gourmande attention à notre arrivée: son désormais célébre Far Breton maison. Un très grand merci pour vos excellentes appréciations, cela me touche beaucoup, la bretagne est toujours belle même en hiver, au plaisir de vous revoir peut être un jour, Mme Rouzes. sublime location dans un cadre éblouissant avec des propriètaires entiers et généreux. Quelle bonheur d'avoir passé une semaine dans ce cadre sublime de cette Bretagne authentique, que dire des propriétaires toujours à l'écoute des vacanciers et surtout d'une gentillesse hors norme, la location mérite beaucoup plus que 5 étoiles et en parler serait trop long, vraiment une semaine de bonheur. Petit coucou aux propriétaires, c'est certain nous reviendrons et nous vous retrouverons avec grand plaisir durant le mois d'aout. Surtout portez vous bien et nous vous souhaitons une année 2019 digne de votre implication dans ce gite, très bonne année 2019 à vous. Un grand merci pour vos appréciations, meilleurs vœux pour 2019 et ce sera un plaisir de vous revoir, Mr et Mme Rouzes. Enfin, des vacances( trop courtes) réussies ! très touchés par vos appréciations, nous vous adressons un très grand merci.Vous aussi vous êtes très sympathiques et nous espérons vous revoir une prochaine fois, encore merci, Mr et Mme rouzes. Merveilleuse semaine dans cette jolie maison de plain-pied entourée d'un très beau jardin bien entretenu et jouissant d'un calme absolu. La maison est lumineuse et dispose de mobilier et d'équipements de qualité. Nous y avons été accueillis très gentiment par la propriétaire qui nous avait réservé far breton et cidre. La région est très riche en ponts d'intérêts : falaises de Plouha, Paimpol, île de Bréhat, sillon de Talbert, Tréguier et sa cathédrale. C'est sans aucune réserve que nous recommandons cette location à qui veut découvrir cette belle côte de Bretagne. Un grand merci pour le chaleureux accueil. Merci beaucoup pour ce commentaire fort élogieux de votre part et sommes ravis que vous appréciez le gîte et sa région. Nous espérons avoir le plaisir de vous accueillir de nouveau. Cordialement, Mr et Mme Rouzes. close to the sea, the sandy beach of pors-guyon, you can see a magnificent panorama overlooking the estuary of the Trieux and the archipelago of Bréhat, angling possible near the coast (bars). shellfish. unique site in Europe, the Sillon Du Talbert 1km, a geological curiosity, a spectacular exeption of nature that gives you an appointment to walk at the water's edge at 3 km. 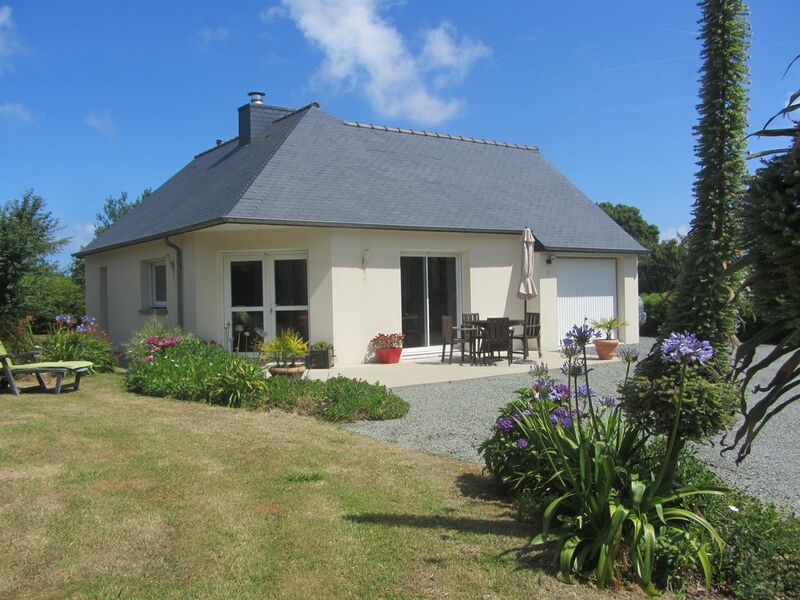 From the cottage you will see the island of Bréhat, nearby, you have the sandy beach of Pors-Guyon, you have a magnificent panorama overlooking the estuary of the Trieux and the archipelago of Bréhat. many coves of sand all around, swimming allowed, possibility of kayaking at sea, stroll GR34, the island of Bréhat can be visited, the tour of the island, service of stars near paimpol. detached cottage, quiet, surrounded by greenery, while being close to the sea and its small beaches that surround our so-called wild peninsula, by the GR34 beautiful walks along the coast. you are 5 minutes from shops, village groceries, bread, need more important cities, Paimpol 15 km with its port, its Tuesday market, spectale street summer, Wednesdays port Tréguier, 15 km quoted medieval, its Wednesdays celebrating, with its culinary traditions, musical, stands, entertainment, village and terraces parties. You like to discover, to hear the rippling water; embark at Lézardrieux to discover the maritime environment. need a heated pool of seawater in the winter? Trégastel proximité.Vous you like oysters and mussels you buy them on the spot. equestrian center 1km. Many beaches with swimming allowed. boat trips, fishing, sailing, relaxing. boat trip on the Trieux from Lézardrieux (Bréhat), or a walk on the waters, the groove of Talbert, an arrow from pebbles and sand three kilometers long .A good restaurant at the foot of that path. the Marine Aquarium Trégastel, the pink granite coast. Our entire tip of Brittany coasts of Armor, is on the edge of the sea. (sandy beach coves all around) .Discover the pink granite coast seen from the sea and the archipelago of the seven islands + stopover at the island to the monks. summer activities, discovery sailing or kayaking, kayak excursions with guide, nautical walks with guide, with discovery of the lighthouse of the Cross, the Trieux, the archipelago of Bréhat. Brand new, aboard the ferry, depending on the tides and seasons, from March to October, walks are proposed, the Trieux, the estuary to loguivy of the sea, the island wood, Lézardrieux, Roche -jagu, admire the soft sunset over the bay. Horseback riding on the island at Bois seaside. Fishing on foot, fishing, windsurfing, canoeing, hiking, mountain biking (itinerary), boat trip, golf, zoo, animal park, in Trégomeur , restaurants, creperies at few distances, antique, flea market, craft shop, natural baths. Not to mention the hiking of our peninsula wild for nature lovers. Deep-sea fishing with hulls, hulls, oysters, shrimps, scallop shells. Beautiful cathedral to visit in Tréguier, as well as its half-timbered houses. Discover Beauport Abbey located in a sheltered bay of Paimpol Bay. New, a small tourist train tour in Paimpol to visit the Paimpolais coast for the season. To see the Festival of sea songs GR34, sailing, diving, windsurfing. The Paimpol Sea Museum invites you to travel, an abbey above the Paimpol cove, the jagu rock estate and its gardens free and open access, discover the life and work of Ernest Renan in his birthplace in Tréguier, Ploumanac'h is famous for its pink granite rocks. Equestrian Center in Kermouster 900m from the cottage. Boat trip on the Trieux with the "Passeur du Trieux", sailing course possible with the Glénans sailing school. Visit of the rock castle jagu, with its exhibitions and cultural activities. The city of Pontrieux invites you to a charming boat trip to contemplate its fifty restored wash houses. A rise from Paimpol to Pontrieux steam, a trip to the past. The city of Plouha which owns the highest cliffs of Brittany. My pets are accepted free of charge. The Presqu'île will surprise you with its landscapes and its wild spaces. The côtes d'armor invites you to discover on foot, on horseback or by bike all its natural riches. Take the time to visit the beautiful Breton cities of Armor Coast and ptofiter Breton flavors, St Jacques shells, Paimpol coco, pancakes, pancakes, baked potatoes at the Sillon du Talbert restaurant. Cape to the archipelago of seven islands off the coast of pink granite, all year depart Perros-Guirec. Hiking Gr34 next, electric bikes for rent next. Nettoyage facultatif. 50 euros.Draps sur demande 12 euros la paire.Nous louons à la semaine du samedi au samedi, toute l'année. .Caution 25% à la réservation.Votre location sera bloquée dès que vous aurez confirmé votre accord. La maison étant lumineuse par ses baies vitrées et son isolation, peu de charge,gratuit l'électricité l'été. l'eau gratuite, le gaz gratuit.La taxe de séjour, 0,90 euro par personne, gratuit moins de 16 ans.Animaux autorisés gratuit.